The schools were all different and all interesting. The students asked great questions. At every school, at least one person asked me if I drew the dragons. Sadly, I can’t take credit for that. That honor goes to Eric Deschamps. 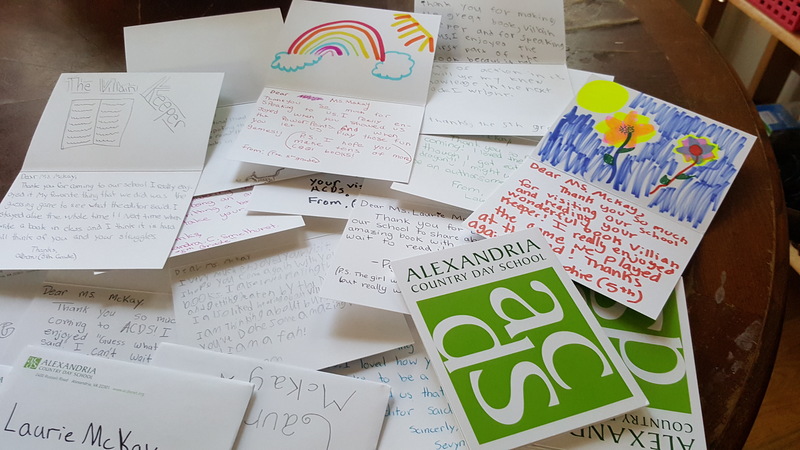 One cool thing, a few days after the visits I received a nice pack of cards from the kids of Alexandria County Day School. Posted on November 24, 2015 November 24, 2015 by mckayllPosted in EventsTagged Alexandria, cool things, HoorayForBooks, school visits. Previous Previous post: And book three of The Last Dragon Charmer is titled….